TJ’s instrumental program performed musical pieces they’ve been preparing since the start of the school year during their fall performance. On September 27th, Thomas Jefferson’s instrumental department put together a great performance for their peers, teachers, and families. The night presented the opportunity for students to display their instrumental skills by performing in ensembles. The fall band and orchestra concert was the first of many throughout the year and it set the bar high for upcoming concerts. This time of year is always hectic for the band and orchestra director Robin Johnson. Not only is she juggling performances with sports games and other events, but she also has to prepare her students for the fall band concert. Throughout the years, Johnson has always set up a theme for the concert’s musical pieces to follow. This year’s theme was chamber music, which meant small ensembles from the advanced and concert band/orchestra would perform classical pieces. This year, the concert was student-driven. After Pep Band’s homecoming performance, Johnson was able to direct all of her attention to the upcoming concert and prepare her students for the event. Students were given their sheet music and separated into their small ensembles to practice. The student musicians were free to practice in whichever way they pleased, either by sight-reading or dissecting their music section by section. Johnson would regularly pop in to check on the ensembles and make sure their performances were going in the right direction. When the night of the performance came around, the students felt some pre-performance jitters. “Before the concert, I felt pretty nervous, but we ended up being able to get everyone together and rehearse for the upcoming night,” explained junior Sahaj Padhiar. Despite their nerves, the students put on a great show. Divided off by which instruments they played, the ensembles were directed on stage. For this concert, senior Julia Moir acted as stage manager. “My responsibility was keeping everybody focused,” expressed Moir. She has been a band member since her freshman year and has gained plenty of experience with the concerts. Moir understood just how chaotic it can get backstage, so she decided to take on a leadership role in order to help the night flow smoother. The audience was captivated by the performances throughout the night. TJ’s theater teacher, Michael Palmieri, is a regular attendee at the concerts. “There’s a reason why I come to see student performances. I believe it’s an opportunity to see the students somewhere else besides the classroom in one of their passions which helps build that teacher-student relationship,” stated Palmieri. Every year, he is pleased by the student performances and Johnson’s hard work. The students were also satisfied with the showcase. “The night was full of fun and I’m glad I got to perform engaging music pieces,” vocalized senior Aidan Schlue. Schlue got the opportunity to perform in two ensembles playing his violin, which was a challenge he was glad to accept. 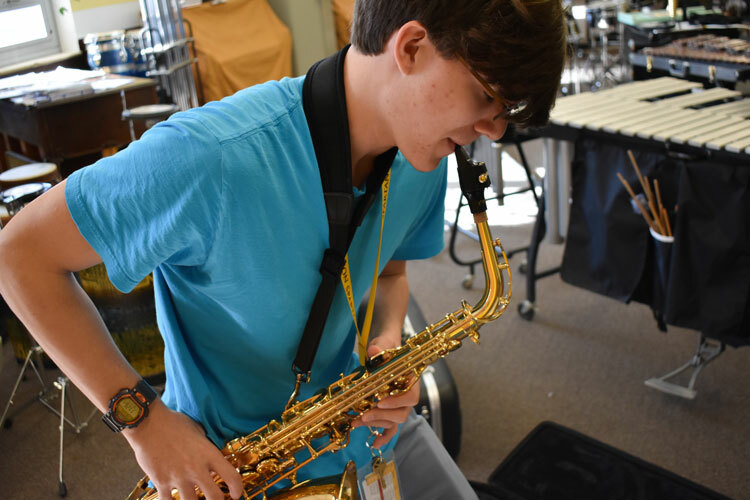 Band and orchestra gives students creative freedom to express themselves with their instruments and challenge their musical abilities. The band and orchestra concerts are always an enjoyable experience where TJ’s student musicians can showcase their hard work and talent.